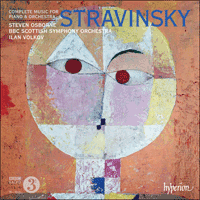 A new album from the Gramophone Award-winning team of Steven Osborne, the BBC Scottish Symphony Orchestra and Ilan Volkov. Here they present Stravinsky’s complete music for piano and orchestra as a rare complete set, plus the Concerto in D for string orchestra. The taut rhythmic brilliance of this music is perfectly suited to the particular artistry of these performers. 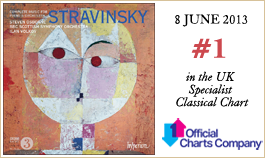 Volkov’s mastery of Stravinsky’s neo-classical idiom is clear from the ecstatic critical response to his recordings of many of the composer’s orchestral works. Igor Stravinsky enjoyed a lifelong association with the piano. From his earliest childhood works to a few preliminary sketches for a piano sonata left incomplete at the time of his death in 1971, the composer was seldom far from the keyboard. His piano works often serve as harbingers for larger, more familiar compositions. One often sees new contrapuntal patterns, new textural outlays, and new harmonic combinations emerging in a piano work just before appearing in the larger symphonic and choral works. Stravinsky himself referred to the piano as the ‘fulcrum’ of his compositional discoveries. The simple truth is that, in comparison to some of the composer’s landmark compositions such as The Rite of Spring, Symphony of Psalms, and the Symphony in Three Movements, his piano literature (including the works on this recording) is too often unjustly neglected. Yet each piano work, while significant in itself, also opens new doors to understanding Stravinsky’s sustained compositional evolution. In addition to composing and conducting, Stravinsky assumed the role of a touring concert pianist for the better part of three decades. Written for his own unusually large hands, his piano music is idiosyncratic, and consequently often prodigiously difficult. The composer undertook concertizing with typical fervour. He devoted hours to honing his pianistic skills while also studying with the well-known pedagogue Isidore Philipp. Given his concerns about the excessive ‘emotive exploitation’ of his works by other interpreters, Stravinsky often retained the exclusive rights to public performance for years before permitting others to play his piano works. The Apollonian virtues of neoclassicism’s clarity and leanness, to which the composer had been steadily drawn, were made unmistakably evident in his landmark Octet for wind instruments of 1923. Immediately following the Octet came the Concerto for piano and wind instruments, wherein the piano takes on a virtuoso concertante role, partnering an equally important wind ensemble (with no strings other than double basses). The Concerto was written in Biarritz in 1923–4 and dedicated to Natalie Koussevitzky, whose husband, Sergei Koussevitzky, conducted the May 1924 premiere in Paris with Stravinsky as the soloist. This three-movement work opens with a Largo written in the style of a French Overture. The stylized dotted rhythms quickly give way to a mechanistic Allegro reminiscent of many of the hard driving movements found among Bach’s keyboard Partitas and English Suites. The form of the first movement is somewhat akin to a classical concerto, complete with a developmental middle section that brings to mind the Czerny and Hanon keyboard studies familiar to all budding pianists. The recapitulation leads to a rhythmically complex, jazzy piano cadenza in the style of Gershwin, disclosing just how taken by American jazz, especially ragtime, Stravinsky had become. The movement ends with a return to the opening stately French Overture material. The middle movement, originally written as a Larghissimo but changed to Largo in the revised 1950 score, incorporates a wondrously serene cantabile style of piano writing not often found in Stravinsky’s music of the 1920s. The movement’s two melismatic cadenzas carry a very rare rubato marking, while the pianistic writing is clearly rooted in the highly ornate filigree so often encountered in the slow movements of Beethoven’s early piano sonatas. The closing Allegro, with its percussive opening material built around open fourths and fifths, exhibits a satirical pastiche blending café tunes, jazz rhythms and even a Baroque-styled fughetta that appears out of nowhere. Taken as a whole, the movement bears a clear relationship to the keyboard toccatas of the eighteenth century, with rapid changes of contrasting and often seemingly unrelated material. Stravinsky performed the work nearly fifty times over the next few years, and its success spawned the composition of several subsequent works for solo piano, two pianos, piano and orchestra, and piano and violin. Igor Stravinski eut la joie d’être indéfectiblement lié au piano: depuis ses toute premières pièces d’enfance jusqu’aux quelques ébauches préliminaires d’une sonate pour piano laissée inachevée à sa mort, en 1971, il s’éloigna rarement du clavier. Ses œuvres pour piano annoncent fréquemment des compositions plus vastes, plus familières. Souvent, de nouveaux modèles contrapuntiques, de nouvelles conceptions de texture et de nouvelles combinaisons harmoniques surviennent dans une pièce pianistique juste avant de le faire dans ses grandes œuvres symphoniques et chorales. Lui-même voyait dans le piano le «pivot» de ses découvertes compositionnelles. La vérité, c’est que, comparé à certaines de ses compositions phares comme Le Sacre du printemps, la Symphonie des psaumes et la Symphonie en trois mouvements, sa littérature pianistique (y compris les présentes œuvres) est trop souvent, et injustement, oubliée. Pourtant, chacune de ces partitions, déjà importante en soi, ouvre de nouvelles portes sur la compréhension de l’évolution soutenue du compositeur Stravinski. En plus de composer et de diriger, Stravinski poursuivit, pendant trente ans, une prenante carrière de concertiste. Rédigée pour ses mains inhabituellement grandes, sa musique pianistique lui est propre et est donc, souvent, prodigieusement difficile. Il envisageait les concerts avec une ferveur toute personnelle et passait des heures à peaufiner son art pianistique tout en étudiant avec le célèbre pédagogue Isidore Philipp. Soucieux de la «surexploitation émotionnelle» de ses pièces par d’autres interprètes, il en garda souvent les droits exclusifs d’interprétation en public, attendant des années avant de laisser d’autres pianistes les jouer. La clarté et la ténuité apolliniennes du néoclassicisme, vers lesquelles Stravinski avait été progressivement attiré, apparurent avec une indubitable évidence dans l’Octuor pour instruments à vent, œuvre phare de 1923, immédiatement suivie du Concerto pour piano et instruments à vent, où le piano assume un rôle virtuose concertant, partenaire d’un ensemble de vents tout aussi important (sans cordes autres que les contrebasses). Écrit à Biarritz en 1923–4, ce Concerto fut dédié à Natalie Koussevitzky, épouse de Sergei Koussevitzky, qui en dirigea la création en mai 1924 à Paris, avec Stravinski en soliste. Cette œuvre, en trois mouvements, s’ouvre sur un Largo rédigé dans le style d’une ouverture à la française. Les rythmes pointés stylisés s’effacent rapidement devant un Allegro mécanique rappelant nombre des mouvements menés tambour battant dans les Partitas et les Suites anglaises pour clavier de Bach. La forme du premier mouvement s’apparente un peu à celle d’un concerto classique, avec un développement central renouvelé des études claviéristiques de Czerny et de Hanon, bien connues des pianistes en herbe. La réexposition mène à une cadenza rythmiquement complexe, jazzy, à la Gershwin, qui montre combien Stravinski avait été happé par le jazz américain, surtout le ragtime. Le mouvement s’achève sur le majestueux matériau inaugural d’ouverture à la française. Le mouvement central, un Larghissimo changé en Largo dans la révision de 1950, intègre un pianisme cantabile, merveilleusement serein, peu fréquent chez le Stravinski des années 1920. Les deux cadenzas mélismatiques de ce mouvement portent une rarissime indication de rubato, tandis que l’écriture pianistique s’enracine manifestement dans le filigrane très orné, dont Beethoven para si souvent les mouvements lents de ses premières sonates pour piano. L’Allegro conclusif, avec son percussif matériau liminaire bâti autour de quartes et de quintes à vide, expose un pastiche satirique mêlant airs de cabaret, rythmes de jazz et même fughetta baroquisante surgie de nulle part. Globalement, ce mouvement présente une évidente filiation avec les toccatas pour clavier du XVIIIe siècle et leurs rapides changements de matériaux contrastifs souvent non connexes, du moins en apparence. Pendant les quelques années qui suivirent, Stravinski exécuta près de cinquante fois cette œuvre, dont le succès lui inspirera plusieurs pièces pour piano solo, deux pianos, piano et orchestre, ou encore piano et violon. Igor Strawinsky war dem Klavier sein Leben lang verbunden. Von den Werken aus seiner frühesten Kindheit bis zu einigen vorläufigen Skizzen für eine Klaviersonate, die zum Zeitpunkt seines Todes im Jahre 1971 unvollständig zurückblieben, war der Komponist nur selten weit von einem Klavier entfernt. Seine Klavierwerke fungieren oft als Vorboten von größeren und bekannteren Werken. Es finden sich häufig neue kontrapunktische Strukturen, neue Texturen und neue harmonische Kombinationen in Klavierwerken, die dann kurz danach in größeren symphonischen Arbeiten und Chorwerken auftraten. Strawinsky selbst bezeichnete das Klavier als „Angelpunkt“ seiner kompositorischen Entdeckungen. Einfach ausgedrückt verhält es sich so, dass verglichen mit einigen der großen Werke des Komponisten—wie etwa das Frühlingsopfer, die Psalmensymphonie und die Symphonie in drei Sätzen—seine Klavierliteratur (einschließlich der hier eingespielten Werke) oft zu Unrecht vernachlässigt wird. Dabei sind die Klavierwerke nicht nur an sich wichtige Werke, sondern sie werfen auch neues Licht auf die anhaltende kompositorische Entwicklung Strawinskys. Neben seiner Tätigkeit als Komponist und Dirigent nahm Strawinsky über fast drei Jahrzehnte hinweg die Rolle des reisenden Konzertpianisten ein. Seine Klavierwerke entstanden für seine ungewöhnlich großen Hände und sind recht eigenwillig gestaltet und daher oft außergewöhnlich schwer. Der Komponist konzertierte mit charakteristischer Inbrunst. Er verwendete viele Stunden darauf, seinen pianistischen Fähigkeiten den letzten Schliff zu verleihen und studierte gleichzeitig bei dem berühmten Pädagogen Isidore Philipp. Aufgrund seiner Bedenken bezüglich übermäßig „gefühlsbetonter Ausnutzung“ seiner Werke durch andere Interpreten, behielt Strawinsky sich oft jahrelang die exklusiven öffentlichen Aufführungsrechte vor, bevor er es anderen gestattete, seine Klavierwerke zu spielen. Die apollinischen Tugenden der Klarheit und Schlankheit des Neoklassizismus, zu denen sich der Komponist stets hingezogen fühlte, werden deutlich in seinem bedeutenden Oktett für Blasinstrumente von 1923 sichtbar. Direkt nach dem Oktett kam das Konzert für Klavier und Blasinstrumente, in dem das Klavier eine virtuose konzertante Rolle einnimmt und mit einem ebenso wichtigen Bläserensemble (ohne Streicher, mit Ausnahme der Kontrabässe) zusammen wirkt. Das Klavierkonzert entstand 1923/24 in Biarritz und wurde Natalie Koussevitzky gewidmet, deren Ehemann, Sergei Koussevitzky, im Mai 1924 die Premiere in Paris dirigierte—Strawinsky spielte den Solopart. Das dreisätzige Werk beginnt mit einem Largo im Stil einer französischen Ouvertüre. Die stilisierten punktierten Rhythmen gehen schnell in ein mechanisch anmutendes Allegro über, das an die vielen vorantreibenden Sätze erinnert, die sich in den Englischen Suiten und Partiten für Tasteninstrument von Bach finden. Die Form des ersten Satzes ist sozusagen verwandt mit dem klassischen Konzert, inklusive eines durchführungsartigen Mittelteils, der für alle angehenden Pianisten unmissverständlich an die Klavieretüden von Czerny und Hanon erinnert. Die Reprise leitet in eine rhythmisch komplexe, jazzartige Klavierkadenz im Stile Gershwins hinein, was zeigt, wie begeistert Strawinsky vom amerikanischen Jazz und besonders dem Ragtime war. Der Satz endet mit einer Rückkehr zu dem Anfangsmaterial mit dem Duktus der würdevollen französischen Ouvertüre. Der mittlere Satz war zunächst als Larghissimo angelegt, wurde in der überarbeiteten Version von 1950 aber zu einem Largo. Es kommt hier ein wunderbar heiterer kantabler Klavierstil zum Ausdruck, der in Strawinskys Musik der 1920er Jahre nicht oft anzutreffen ist. Die beiden melismatischen Kadenzen des Satzes sind mit äußerst seltenen Rubato-Markierungen versehen, während der Klavierstil offensichtlich in dem kunstvoll ausgeschmückten Duktus verwurzelt ist, der so oft in den langsamen Sätzen der frühen Beethovensonaten zum Ausdruck kommt. Das abschließende Allegro beginnt mit perkussivem Material, das aus leeren Quarten und Quinten konstruiert ist. Der Satz stellt ein satirisches Pasticcio dar, in dem Kaffeehaus-Melodien, Jazzrhythmen und sogar eine barockartige Fughetta, die aus dem Nichts erscheint, miteinander verarbeitet sind. Insgesamt gesehen zeigt der Satz eine enge Beziehung zu den Toccaten für Tasteninstrumente aus dem 18. Jahrhundert auf, wo rasche Wechsel von kontrastierendem und oft scheinbar unverwandtem Material stattfinden. Strawinsky führte das Werk im Laufe der folgenden Jahre fast 50 Mal auf und sein Erfolg regte weitere Kompositionen für Soloklavier, zwei Klaviere, Klavier und Orchester sowie Klavier und Geige an.